Best Fantasy and Science Fiction: Keith Parkinson - "Master of Fantasy Art"
I figured for my first blog post I would write a tribute to one of my favorite fantasy artists, Keith Parkinson. The man touched many lives and will be remembered in the hearts and minds of past and future generations. 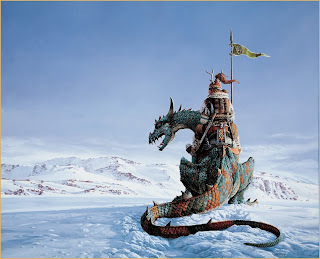 From fantasy series such as Dragonlance and Forgotten Realms to authors such as Terry Goodkind and Margaret Weis; Keith Parkinson's book covers have captured the imaginations of millions and set new standards for the fantasy and science fiction genre. Left you will see "North Watch". This was the first painting that introduced me to Keith Parkinson and I still adore it to this day. "North Watch" was the first painting I had to have in my dragon collection. It's really what invigorated my love for dragons. To this day I still do not have a print or giclee, and I just ran across the re-opened Keith Parkinson website and they are available! It's too bad I have no where to place such a fine piece of artwork. Keith truly knew how to paint both in-depth landscapes and yet minimal landscapes at the same time. The original landscape and character painting Keith did for the MMORPG Everquest was the second painting I fell in love with. This one I do own but sadly it sits propped against a wall in its all too expensive frame and matting. There were 3 total in the Everquest series, one for each expansion up to that point ("Scars of Velious", "Planes of Power", and "Shadows of Luclin"). Left you will see "Druid Stone", one of Keith's paintings he did for the shear joy of painting...and it shows. This is an excellent testament to what a great artist can do with just a love for the genre. "He (Keith) wasn’t just a painter; he was a true artist, who found layers of depth in everything he did, who breathed life into canvas and emotions into paint." (R.A. Salvatore). Here you will find Wizards of the Coasts' tribute to Keith Parkinson with quite a few farewell statements and sentiments about his artwork, the great person he was, and the great friendships and lasting impressions he made. Thank you Donna, Mary, Nicolas and Zachary for sharing Keith with us. Your insight into our beloved fantasy worlds will never be forgotten Keith. You will be missed! *All images in this post copyright Keith Parkinson. Even sadder...I didn't know until late last year. I felt horrible since he is one of my favorites! Thus my first post had to be about Keith. Thanks for your comment! Around 20 years ago i found a picture on the back of a game box that blew my socks off. It was a desert-nomad type guy riding on the back of a two legged dinosaur. I've always loved dinosaurs and fantasy / science fiction and this blend was fantastic. I couldn't find any artist's names on the box so i got it color photocopied and blown up to a small poster to hang on my wall. Yesterday i was in a used bookstore and there was a gaming manual with that very cover and inside was Keith Parkinson's credit. Finally after all this time i found out who did the art. But now i find out that Keith died 5 years ago. I finally find him and he's gone. Does anyone know the name of the print that i'm talking about? i would love to have the real thing on my wall for the rest of my life as a small dedication to an artist i hardly knew. Til now this was the only picture i knew. and now i can get caught up on all i missed.